I got my order from Joann's yesterday! I love all my new goodies. My Ott-Lite is coming separately, hopefully today. I'm hoping it's a good light. I will let you all know when I get it. I'm hoping it will be a good light to take on vacation with me. My favorite thing that came are these Pewter Gingher Scissors. Not a huge difference from yesterday, but this picture is better. I have found that taking a picture in my light box (I use my Daylight stitching light for the light source over the box) is better than taking one outside. I get more accurate color doing it that way. Anyway, I hope to get finished with the house and get started on the sky today and hopefully I'll be finished with this block by this weekend. I plan to move up to block 3 and then go over to block 5, then 2, etc. 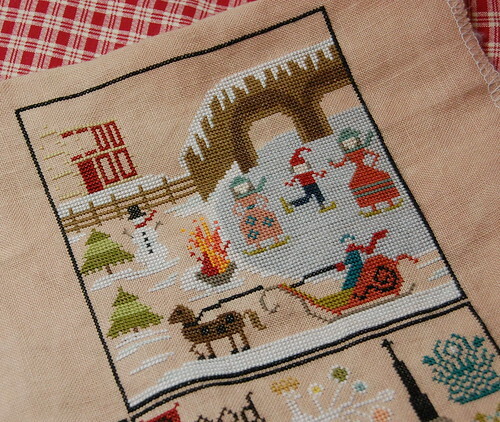 Since I stitch in hand I figure there will be less handling of the actual sampler if I do it this way. 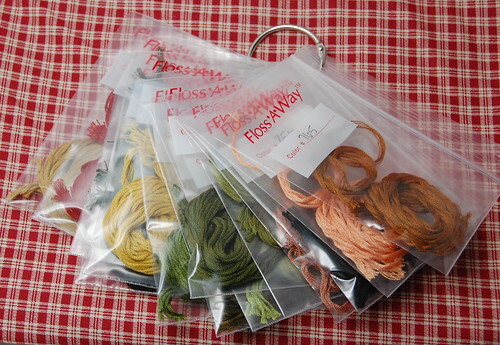 Another thing I've decided to go back to with my silks is Floss-A-Way bags. I found that they were getting really tangled on the Thread Drops and thus wearing them down. I will still use the Thread Drops for my cottons, but I think putting the silks in the bags will cut down on wear and tear. Well, thank you all for your very kind comments yesterday! Write soon! You got some really pretty new stash there and I love your new scissors too! Your progress on CoHRH is really lovely! I love the colors on this block you are workin on. I have never tried the floss bags, but that may be something to check out. Your mailbox must be such fun to go to most of the time!! Hope to visit with you soon on IM! I enjoy following your blog. Your new scissors are beautiful. I may splurge on a pair myself. The CoHRH is beautiful. I am still working on deciphering the initials so I can find the pattern. I just started my own blog . . . not much up yet, but working on it. The new scissors look beautiful! I love the fabrics. I know the top one is from French General which was what I was looking for so I will head to the site and check it out. I love that skating party block. I read on Kathy's site that she has designed Autumn at HRH - another one to add to your list! Great stash...love the fabrics! Great progress on your block #6! 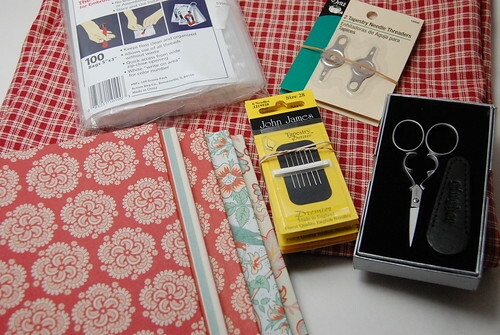 Love those fabrics Nicole, and I especially love those scissors! I think that I must have a pair!!! I've used floss bags for years for projects after using those thread bobbins for a long time before that. I like the bags because they just hold everything so much better. Nice stash! Love those scissors! And those French General journal sets too -- yum! Your block 6 is so pretty! And as for the floss away bags -- I admit that's all I use. I'm one of those people who keep ridiculously small pieces of thread, so I need the bags. lol! It's always fun to get new stash. Those scissors are fabulous! Lovely new stash and some wonderful progress on CaHRH. Love your new stash! Your progress on CaHRH is making me want to start that! It's beautiful. Love the goodies you got from Joanne's. The Ginghers are fabulous! Your CaHRH is looking wonderful - I really like this block. I honestly hadn't noticed it much before in the overall chart photo, but now I think it may be one of my favorites! I have found that the storage container, the one that mechanics often use to put different little bits in, with around 30 drawers, works quite well. I will post a pic on my blog in a few for y'all to see. I have 2 of these containers and probably need at least 1 more. I love those new scissors! Lucky you! And your CaHRH is really amazing Nicole!!! Great new stash, Nicole. The scissors are really pretty. Your CaHRH is looking awesome. You will have it done in no time and we'll all be SO jealous! I love the scissors!! Your CHRH is turning out beautifully. I have yet to start, but I drool seeing it come to life. Great stash Nicole and cute scissors. We're trying to find scissors to carry in the shop but mary ann (owner) does not want to pay large amounts of money for scissors. 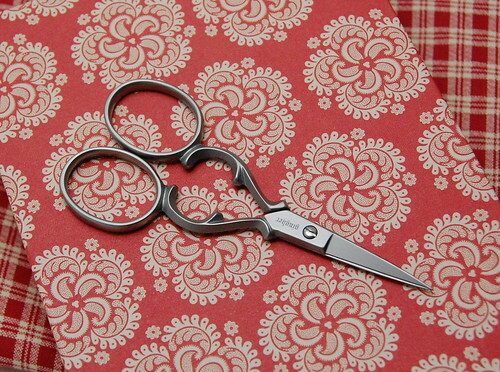 Love those new scissors and your stitching is gorgeous, as usual! I've been using Ott lights for about 9 years now--I have a small one for taking to EGA meetings, stitchins and classes and a large one that sits next to my stitching chair...I think you will love it. I also keep my silks in bags too. Just got me a box put together to hold just my silks which I have very few. Lovely scissors (I'm a scissor nut, love to see anybody's scissors), And your block is coming along so well. Those scissors look amazing. Do you love them? Great looking other stash, too. Lovely stitching! Great new stash! I've had an ott lite for 10 years now and I love it... actually I have several now! YOur wip is so pretty! I love your CaHRH! It's on my "someday" list, but I've got to do Shores first. I have an OTT lite and I love it for stitching! Lovely stash!